A hearty vegetable soup with chicken, beans and pasta. Uses seasonal vegetables that you can switch as you like. It is all cooked in a flavorful broth. 1 14 oz. can Cannellini or Great Northern beans Lima any kind you like drained or 1 3/4 cup frozen beans or even your choice of dried beans that have been cooked according to directions. Preheat oven to 400 F. Remove the bone from the breast leaving the skin on the breast. Rub the chicken bones with olive oil, salt and pepper. Place the bones in a foiled lined pan with 1/2 cup of water. Roast the bones for 30 to 45 minutes until they start to brown. Choose a heavy stockpot or Dutch oven that will accommodate all the ingredients. Put 2 Tablespoons of olive oil in the pot and turn on the heat to medium high. Brown the chicken breasts by first placing the breasts skin side down. Cook about 4 minutes on one side and then 4 minutes on the other side. Pour the warmed chicken broth over the breasts and bring to a gentle simmer. Add the roasted chicken breastbones plus any renderings to the pan and slowly simmer for 40 minutes. Remove the chicken and bones from the broth. Pass the broth through a fine sieve and into another heat-proof container. Throw away the bones and let the chicken breast cool then shred or dice into bite-size pieces. Put in the butter, oil and diced onion into the stockpot or Dutch oven and turn the heat to medium low. Cook the onion in the uncovered pot until it it wilts and becomes a pale gold color about 6 minutes. Don't let them burn or turn dark. Stir in the trito and continue cooking until it melts and is lightly browned and very fragrant, about 2 minutes. Add the green beans and sliced carrots. Cook for about 2 to 3 minutes, stirring once or twice. These vegetables will take longer to cook so you want to layer as you cook. Add the sliced celery, and cook, stirring occasionally, for 3 - 4 minutes. Add the zucchini and continue stirring the ingredients. Add the shredded cabbage and continue cooking for another 5 or 6 minutes. Add the thyme and oregano. Stir to combine. Add the broth and the tomatoes with their juice plus a light sprinkling of salt and pepper. You can adjust the salt and pepper later on. Add the optional cheese crust now if you have it. Cover the pot and lower the heat so that the soup cooks steadily and slowly at a gentle simmer. When the soup has cooked for 2 hours, add the chicken, kale, peas and the beans. Stir well, cook for an additional 30 minutes. When soup is done remove the cheese crust ,if you used it, and taste for the correct amount of salt and pepper. To serve add pasta and ladle the chicken minestrone on top. Sprinkle the grated cheese on top. This is delicious served with Italian bread. 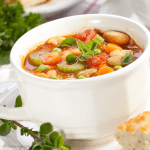 Minestrone is delicious served right away but it is even better reheated. Store in the refrigerator.